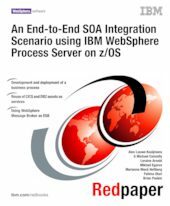 This paper demonstrates an end-to-end SOA integration scenario on z/OS® following a simple business scenario. The paper discusses the architecture, introduces the products used and describes how the scenario was developed. Key products used are WebSphere® Portal, WebSphere Process Server, WebSphere Message broker and CICS® .